Superhero Sayings: Orders are for giving, not for taking. Context: The Swordsman hails from a noble background and has always been a leader in his life. 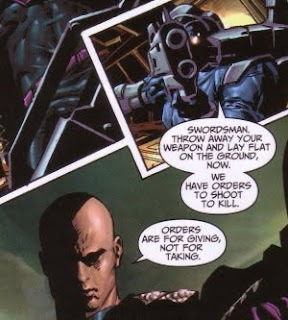 He has begrudgingly been following orders as part of the Thunderbolts for too long. Lesson: Sometimes we need to stop and question the orders we're given because they're always in the interest of the person giving them and not always in your own interest. References: Taken from Thunderbolts: Caged Angels (ISBN: 978-0-7851-2635) by Warren Ellis (writer) and Mike Deodato Jr. (artist). Published by Marvel Comics.